Summary. Our colleague Professor Yurii Yosypovych Kudryavets, talented scientist-oncologist, Head of the Department of Experimental Cell Systems of the R.E. Kavetsky Institute of Experimental Pathology, Oncology and Radiobiology (IEPOR), the NAS of Ukraine, passed away at the age of 71. Yurii Kudryavets was born in 1946 in Kyiv, Ukraine. Upon gradu­ating from Ukrainian Agricultural Academy, Fa­culty of Veterinary Medicine, Dr. Kudryavets started his research activity at the Institute for Oncology Problems (now IEPOR) where he worked to the end of his life. The 1970s marked a significant turning point in understanding the role of viruses in oncogenesis, and right from the beginning, Dr. Kud­ryavets, then young scientist, joined the team that was engaged in problems of oncoviro­logy. His experimental studies on retroviruses were supervised by the founder of our Institute, the prominent Ukrainian scientist academician R.E. Kavetsky. These priority studies have been resulted in the isolation and characterization of two novel rat retroviruses from Pliss lymphosarcoma and Thurzo — Švec erythromyelosis. In 1978, Dr. Kudryavets defended his PhD thesis “Retroviruses in cell lines established from experimental tumors”. In the 1980s, Dr. Kudryavets was focused on studying the antitumor and antimetastatic effects of interferon as multitarget cytokine. These persistent studies culminated in his doctoral thesis “Interferon and tumor necrosis factor as the modifiers of metastasis of malignant tumors” defended in 1999. 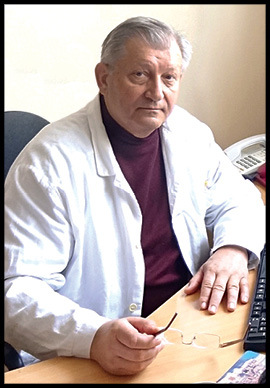 Since 1999, Dr. Kudryavets headed the Department of Experimental Cell Systems (later Laboratory of Model Systems of Experimental Oncology). In 2013, he was awarded the academic title of professor by the specialty “Oncology”. The keen and continued interest of Dr. Kudryavets in in vitro and in vivo experimental models in cancer research, his creativity and persistence made it possible to set up the Depository of Cell Lines and Tumor Strains that was granted officially the status of the National treasure of Ukraine. The scientific interests of Prof. Kudryavets covered a broad range of issues. Among them are metastasis research, anticancer activity of interferon, tumor growth factors and cytokines. Just recently, he was enthusiastically tackled the problems related to the role of epithelial-mesenchymal transition (EMT) in the formation of malignant phenotype and drug resistance of cancer cells, which is in the spotlight of modern cancer research. Prof. Kudryavets initiated a series of research searching for modifiers of EMT-associated cancer cell phenotype and gene expression. He collaborated with clinical oncologists in studying disseminated cancer cells and cytokine profile in bone marrow of patients with colorectal, prostatic and breast cancer and initiated the study of molecular and cell mechanisms of low-dose metronomic anticancer chemotherapy. Prof. Kudryavets was a person of active life and social position. He was a member of the Specialized Dissertation Board on the specialty “Oncology”, member of the Advisory Board of the Department of certification of scientific and educational staff of the State Attestation Committee of Ukraine on biomedical and pharmaceutical sciences, member of biological section of the Committee on State Prizes of Ukraine in Science and Technology. Also for many years he was a member of the editorial board of the journals “Experimental Oncology”, “Onco­logy”, and “Ukrainian Journal of Hematology and Transfusion”. Prof. Kudryavets authored more than 200 scientific publications and presented his results in many Ukrainian and international scientific meetings. He passed his knowledge to young scientists and brought up many followers: five PhD theses were defended under his supervision in 2006–2015. Yurii Kudryavets was a talented creative scientist with a wide range of interests. Sadly, he passed away at a time when he was involved in so many research activities. Our Institute has lost a real enthusiast of science and a wonderful person. The cherished memory of Yurii Kudryavets will remain forever in the hearts of all who knew him.